UW–Platteville head football coach Mike Emendorfer was inducted into the Wisconsin Football Coaches Association Hall of Fame Saturday night at the Marriott West in Middleton. 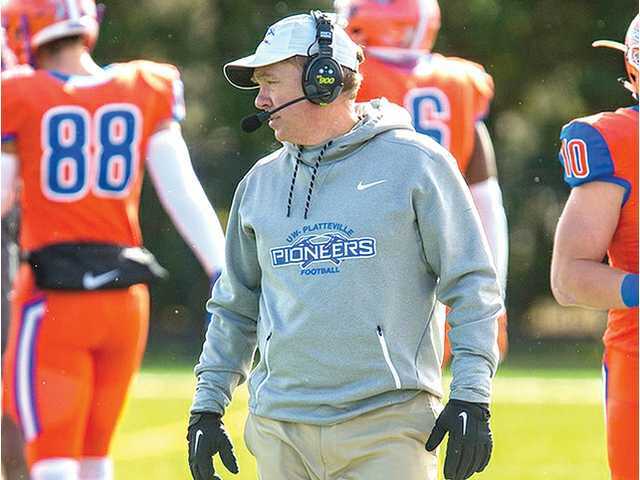 POSTED April 4, 2019 10:08 a.m.
MIDDLETON — UW–Platteville head football coach Mike Emendorfer was inducted into the Wisconsin Football Coaches Association Hall of Fame Saturday night as the selected 2019 College Head Coach inductee. The induction ceremony of the 2019 WFCA Hall of Fame Class was held at the Marriott West in Middleton. Coach Emendorfer completed his 20th season at the helm of the Pioneer football program after being named head coach in 1999. Becoming the all-time winningest coach in program history during the 2016 season, he surpassed the 100-win mark in the 2018 season and his 101 wins rank 9th on the Wisconsin Intercollegiate Athletic Conference all-time list. In his 20 seasons, Emendorfer’s teams have become synonymous with assaulting the record books, as the Pioneers have broken more than 40 school and 10 WIAC records. Emendorfer’s Pioneers have been voted in the top 15 four of the last five years in preseason polls with two of those teams earning NCAA playoff berths. As the coach of the first two teams in school history to make the tournament, Emendorfer’s 2013 season ended in the second round at the hands of North Central. The 2016 playoff run ended after a wild back-and-forth first round contest at St. John’s with the score of 32–31 being decided in the final play of the game. “This means a lot, but it really means more for the UW–Platteville football program, its history, and the success that the teams have earned in the last seven to eight years that grew on the foundation of the teams that played before them,” Emendorfer said. In his first season with the Pioneers, Emendorfer promised “the thrill is in the air,” and he delivered with the team passing for 2,651 yards and 20 touchdowns. This was a far stretch from the program’s former Wing-T running attack. UW–Platteville fans embraced their brand of ball as well, with attendance jumping by average of 904 fans per game from the previous year. Today, as the team continues to hold a national presence, the 2017 Pioneers passed for 2,849 yards and 23 touchdowns while Ralph E. Davis Pioneer Stadium has continued to grow on game day averaging more than 3,500 fans at each home game since the 2010 season. Through his course at UW–Platteville, the veteran coach implemented “Pillars of the Program” that focuses on developing life skills that will carry far beyond the playing days. Coach Emendorfer’s overall plan received wide praise from the Chancellor’s Cabinet in 2009 for such commitment to community service and academics. Emendorfer and his staff focus first on the person, the student, and then the athlete. He leads the team in life skills during the year with sessions on resume writing, tying ties, and interviewing for jobs. He also invites former Pioneer football players back to campus to speak to the current team in order to create opportunities for players to see where life can take them after their college career at UW–Platteville. Coach Emendorfer finds this is not just a great lesson for the athletes, but also a great way to stay connected with alumni. Growing up in Lockport, N.Y., Emendorfer attended William Penn College. During his 1982–85 playing career, he became the Statesmen’s all-time leading receiving with 158 catches, a record that still stands. He came to UW–Platteville after previous stops as the offensive coordinator at Hanover, the offensive coordinator at Quincy University, and the passing coordinator at Grinnell College. He and his wife, Lisa, have two children, Logan and Rachel. Lisa is a lecturer in the Health and Human Performance Department at UW–Platteville. Logan earned his degree from UW–Platteville and is following in his father’s footsteps as assistant football coach at Central College. Daughter Rachel is a junior at UW–Platteville, where she plays on the women’s basketball team and also hopes to start a career in coaching.